Google unveiled its Google Pixel and Google Pixel XL handsets. What strikes first is the convergence of communication codes between Google, Apple, and Samsung, confirming the difficulties of differenciating in commoditization times. That said, Samsung has beefed up its human side, Google its pedagogy dimensions, and Apple... well Apple remained Apple. What strikes next is the focus on image, from the name (Pixel), to the pitch ("highest rated smartphone camera", "Unlimited storage for all your photos and videos"). 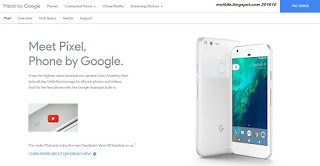 This is not only a Google Phone, but also a Google Camera, and a boost for Google Photos. The Pixel is marketed almost like a featurephone, with a message more... focused than its competitors, even if Apple did stress iPhone 7's "advanced new camera systems", and even if Samsung's ill-fated but polyvalent Galaxy Note 7 offered new arguments ranging from sensors and lenses to Samsung Cloud. The third strike comes from Google Assistant. We knew it existed, we knew it had in its DNA the capacity to help you defeat LEE Sedol*, but its namelessness makes it an even scarier A.I. monster, plugged to both your personal environment (controled by Big G), and to Big G's phenomenal reach in queries about anything, anytime, on any platform. Yes, Siri has a name, but its brains have just been purchased by Samsung, who snatched Viv Labs, the startup created by Siri founders. For Google, launching a competitive smartphone was probably more urgent than rolling out its new convergent OS. * see "Man v. Machine, Garry v. Gary"